Just a quick post to publicise a number of archaeological events that are taking place this weekend and which are open to members of the general public. 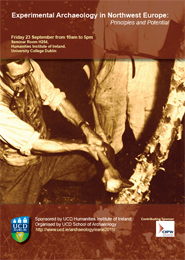 Firstly on Friday the 23rd of September an interesting looking conference takes place in UCD, which discusses the field of experimental archaeology. Attendance at this conference is open to all, but places must be booked by emailing Thomas Kador at: community.archaeology@gmail.com. Experimental archaeology has recently re-emerged as an approach enabling us to think about the past in practical ways, while it also has potential for engaging modern communities with archaeological knowledge. This one-day seminar, organised by Aidan O’Sullivan, UCD School of Archaeology and Thomas Kador, The Cultural Learning Initiative and sponsored by the UCD Humanities Institute of Ireland, will bring together some of the leading experts and projects in Ireland, England, Wales, Scotland, and Denmark and their papers will focus on recent developments and advances in Experimental Archaeology in Northwest Europe and how it might be developed further in coming years. On Saturday the 24th the Irish Museum Association will visit the National Museum of Ireland’s new collections centre at Swords, Co. Dublin. Going forward this brand new facility will house the majority of the museums extensive collection of artefacts. This visit should give a valuable insight into how a modern museum collection should be stored, curated, and preserved. Again this visit is open to interested members of the public, who should contact the IMA at: office@irishmuseums.org or ring (01) 4120939 if they wish to attend. The new collection resource centre at Swords is a 18,000 square metre building (200,000 square feet – the size of two football fields), which will be filled with several million objects over the next two years. The facility has high levels of environmental control and meets high standards of security and fire prevention. It includes collections storage areas and the necessary facilities for offices, archives, library, canteen, study rooms for visitors, and work areas for photography, illustration and conservation. The collections receiving measures include quarantine and freezing. The NMI-CRC is in an industrial unit at Balheary Road, Swords, former home of electronics assembly plant operated by Motorola, then by Celsetica until 2003. There is ample car parking on site and this is the best way to get there. 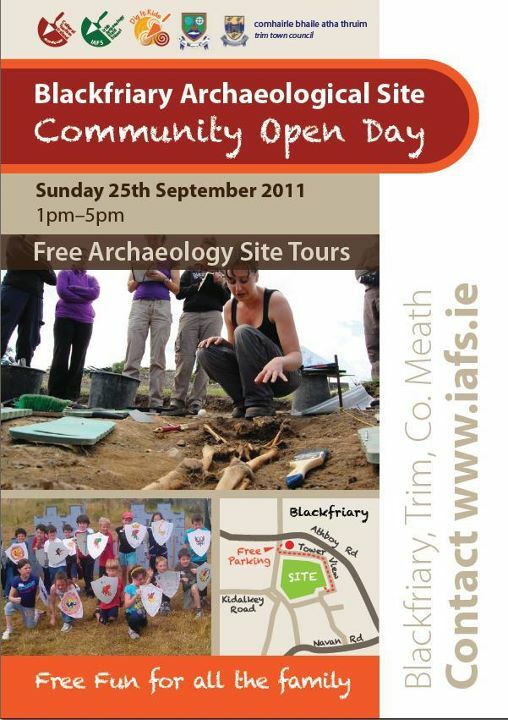 Finally on Sunday the 25th of September the team from the Blackfriary excavations, in Trim, Co. Meath are holding a open day. 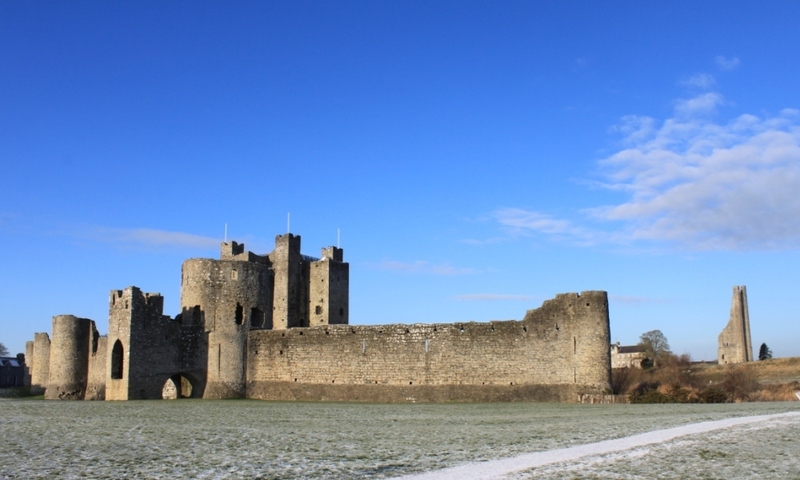 This event, supported by Trim Town Council, Meath County Council and the AIA Site Preservation Programme, will give the public an opportunity to explore the Season 1 & 2 excavations and to examine the artifacts discovered during archaeological excavations works. There will be tours of the site by archaeological site director Finola O’Carroll, and Irish Archaeology Field School staff and students will be on hand with information on the excavation process. The event is family friendly with entertainment including archaeology events for children and a bouncy castle.